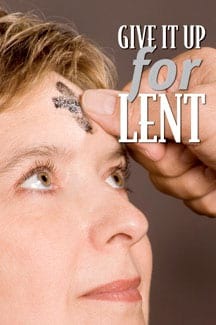 Home Featured Stories Give It Up For Lent! 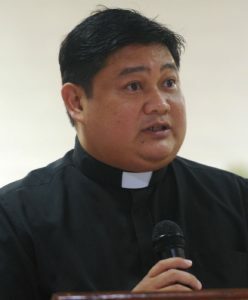 Elmer Tolentino is giving up pinapaitan, dinuguan, fatty foods and beer for lent. 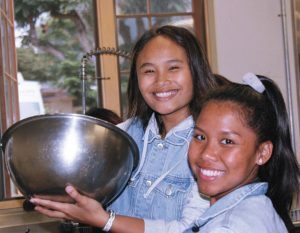 Kimberly Taroma and Rose Anne Rafael cooking during Good Shepherd’s Shrove Tuesday festivities. 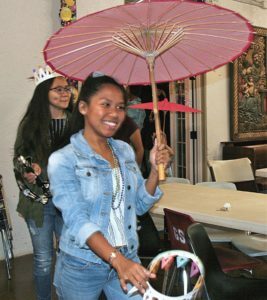 In previous years, the Taroma siblings gave up junk food, soda, candy and watching TV while Garo gave up meat, playing video games, and candy. Rafael gave up meat while Agpoon gave up chocolate and Lau gave up alcohol. Fr. 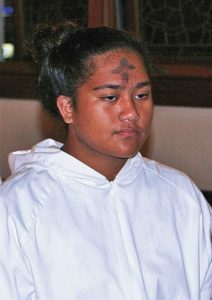 Jojo Alnas of Holy Rosary Church in Pā‘ia elucidates on the topic of Lent. When I was growing up, my mother Catalina taught me that I couldn’t eat meat on Fridays during Lent. 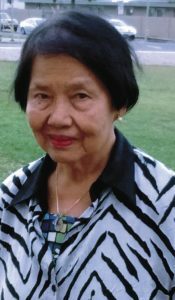 As she did most of the cooking in the house, I had no choice but to follow and our choices were usually tilapia (fried or in a soup), sardines, or tuna. I really liked the tuna with long rice and onions. When Good Friday came around, I had to be very quiet, especially from noon until 3 p.m. and we still could not eat meat until Easter Sunday. 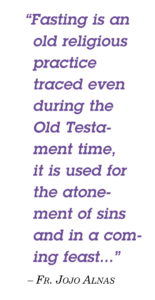 I learned through Christian Education, held on Wednesdays at Good Shepherd and taught by Margaret Cameron and Jay Van Zwalenburg, that Lent was symbolic of the forty days that Jesus was fasting in the desert and being tempted by the devil. In those days, Christian Education included a lot of movies that focused on the parables. We also had time for arts and crafts, running around playing “steal base,” and worship led by Fr. Justo Andres, the Associate Rector of Good Shepherd. Sheena Garo and Rose Anne Rafael during Shrove Tuesday festivites at Good Shepherd Episcopal Church. I think over the years, I normally tried to avoid meat on Fridays but sometimes it just didn’t happen. A few years ago, I even gave up wine. It was not an easy task and I resorted to drinking more whiskeys and sugary drinks like mai tais and margaritas. 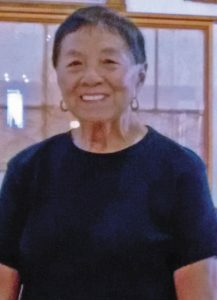 Like Tolentino, beer is on seventy-two year old Yamashiro’s “give up for Lent” list. Shandi Agpoon during Ash Wednesday services. 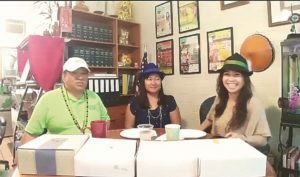 Annual “Malasadas Challenge” on Shrove Tuesday aka Malasadas day in 2018 with Dulce Karen Butay and Sharon Zalsos Banaag at the Law Offices of Alfredo Evangelista in Wailuku. 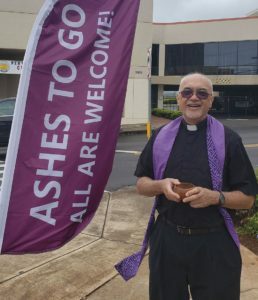 Lent began this year with Ash Wednesday on March 6 (which was preceded by Shrove Tuesday aka Mardi Gras aka Malasadas Day… and yes, due to illness, Sharon Zalsos Banaag, Dulce Butay and I canceled our annual Malasadas Challenge broadcast on Facebook). This year, Palm Sunday is on April 14, Maundy Thursday is on April 18, Good Friday is on April 19, Holy Saturday is on April 20, and Easter Sunday is on April 21. 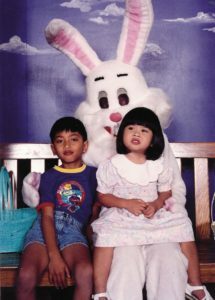 Christian and Danielle Evangelista with the Easter Bunny (circa 1995). As a kid, I loved Easter because of hunting for Easter eggs. To this date, I recall winning $20 for finding the special egg. When my kids, Christian and Danielle were young, we did the whole nine yards of commercialized Easter, even taking photos with the Easter bunny. I’m not sure my kids learned the rite of abstinence during Lent. My daughter Danielle was recently on Maui on a Friday and my task was to pick up dinner for her and four state Senators: Rosalyn Baker, Donavan Dela Cruz, Kalani English, and Gilbert Keith-Agaran. The Senators selected a plate that included fish from Da Kitchen. My daughter chose the kal bi plate—all rice. parties, buying too much clothes and gluttony. 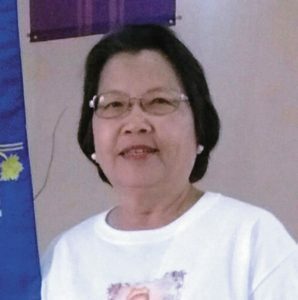 Leo Asuncion, a Christ the King parishioner is abstaining from desserts. 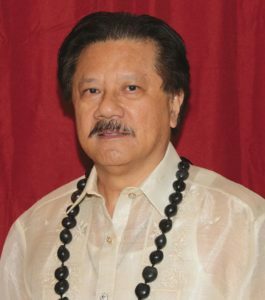 Alfredo G. Evangelista is giving up rice for Lent—except on Sundays which is a Feast Day. Lucy Peros contributed to this article.